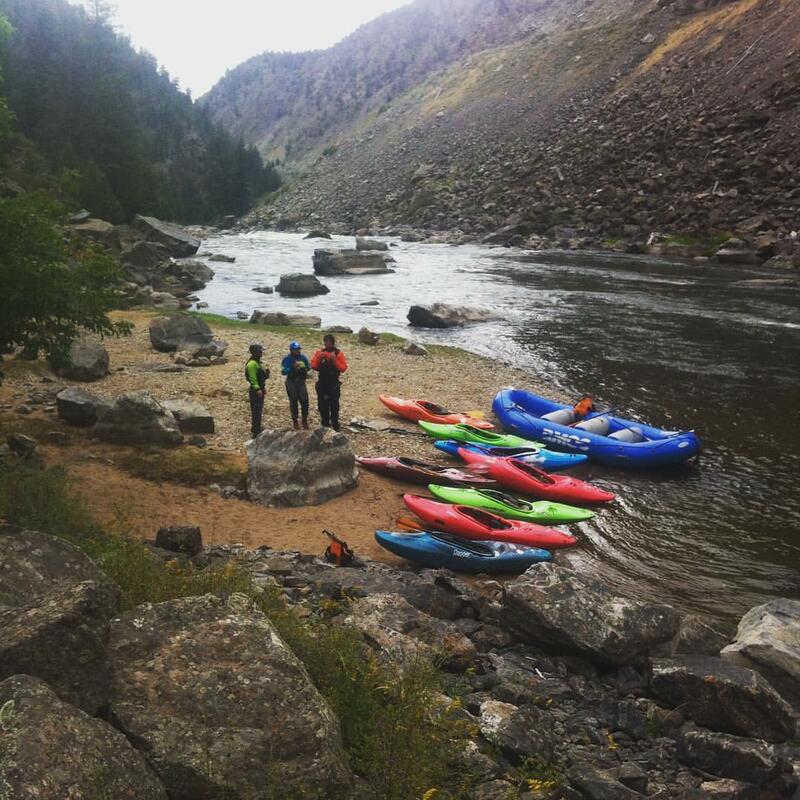 This summer the Rocky Mountain Outdoor Center celebrates one year in its new location at the rafting put-in to Browns Canyon National Monument. It also marks the first operating year in business for several guide stakeholders. Four employees, who have worked at the RMOC for four or more years, purchased small stock bundles last year in hopes to grow the company’s future. Ryan Coulter, whom you might have seen shaping the jumps at Monarch Mountain as head of terrain parks, put his heavy machinery skills to work on the RMOC riverfront campsites and boat ramp this spring. Ryan also oversees maintenance on the RMOC vehicle fleet. Hailing from Maryland, he moved to Colorado in 2011 to attend Colorado Mountain College in Leadville. Ryan started at RMOC in 2013 as a climbing and raft guide, and in 2015 began teaching kayaking and leading ducky trips. Tommy Gram, paddle school director, has taken on additional hiring and training responsibilities. Originally from Wisonsin, Tommy has worked at the RMOC since 2010 on climbing, kayak instruction, ducky, and bike trips. He is also Red Cross certified to conduct First-Aid/CPR certifications and Wilderness First Aid courses. In the winter, Tommy guides backcountry ski trips and teaches basic avalance rescue courses through the American Institute for Avalanche Research and Education (AIARE). April Johnson brings her love of warm weather fun from her home state of Florida. She started raft guiding in 2011on the Nantahala and the Ocoee rivers in North Carolina and Tennessee. In 2013, she moved to Colorado and guided on the Royal Gorge, and moved north to RMOC the next year. In addition to rafting, April teaches stand-up paddling and spends off days on her mountain bike. She manages group accounts, reservations, and the RMOC front office fondly known as the Shred Station. This keeps her busy year-round, with a little time leftover to manage the retail shop and snowboard at Monarch Mountain. Kate Stepan found her way to Colorado from Pennsylvania in 2004. Working at the RMOC for the last nine years as a kayak instructor, raft guide, and ducky wrangler, she now heads up RMOC’s paddling program for local kids (Ark Valley River Riders) and leads the outfitter’s raft guide training program. She also handles bookkeeping and payroll and keeps the RMOC community up to date with an email newsletter. Last winter she taught ski lessons at Copper Mountain. The new stakeholders join majority owner Brandon Slate in managing RMOC’s day-to-day operations in addition to guiding and instructing as much as possible. Brandon, the company’s most highly certified SUP instructor and resident expert splitboarder, has owned RMOC since 2010. Brandon also guides rafts, climbs, bikes, and works part-time as a ski patroller at Copper Mountain in the colder months. He, his wife Teresa Slate, and their 2-year-old Ellison recently welcomed a newborn daughter, Samara, to the RMOC family. Brandon and his Michigan-based real family look forward to making and selling beer for Browns Canyon Brewing Company, a project in its infant stages at the RMOC base just south of Buena Vista, Colorado. Ask us about our employee-owned experience on your next adventure! Chances are your guide is also working hard behind the scenes to ensure every day out there is an epic one.